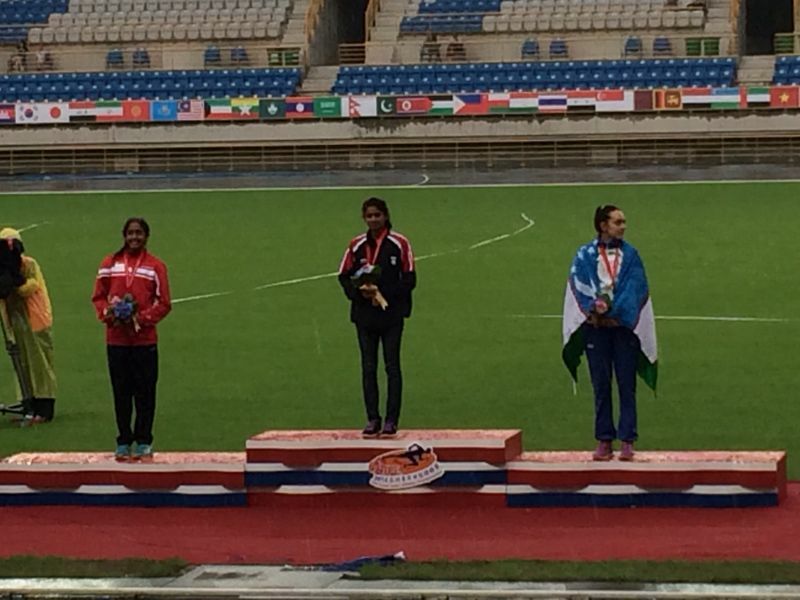 Shanti Veronica Pereira eyebrow-raising performance at Asian Junior – Another medal & national record tumbles! Shanti Veronica Pereira has affirm herself as the Republic top women sprinter with recent sublime performances at the Asian Junior Championship. After grabbing for bronze in the 100 metres event, finishing just behind China’s top duo junior women sprinters, the 18-year-old was halted in her quest for gold in the 200m metres women final. India’s Dutee CHAND, the diminutive built athlete fended off Shanti’s advances, where the final was held on Sunday 15th June. They were inseparable side by side as they sped during the first half of the race, Shanti in lane 5, Dutee in lane 4. Dutee, hailing from Jajpur district after transitioning from the curve to the straight, changed gear, gave a slight burst and stride by stride, left Shanti slightly trailing behind. The race ended in that position. Shanti finished second in a timing of 23.99 seconds to Dutee’s 23.74 seconds. As much as Shanti tried, she had no answer to Dutee’s better speed endurance. Shanti ran a similar timing of 23.99 seconds in the qualifiers to reach the final, however then the windspeed was 2.8m/s tailwind, well above the legal limit for national ratification. 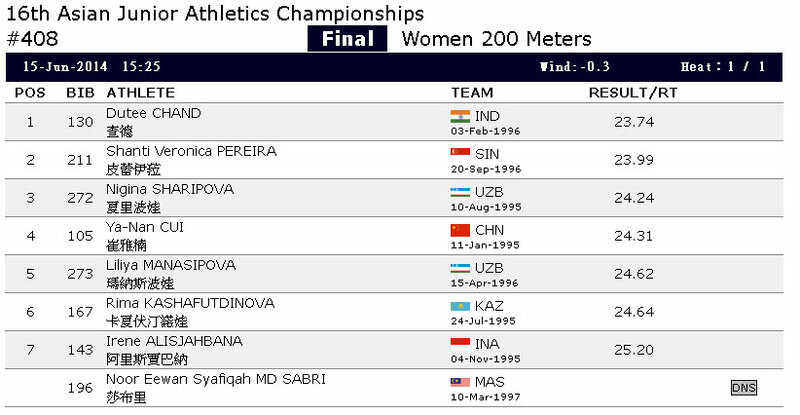 But the finals timing, it was a slight headwind of -0.3m/s which affords her a new national, national junior, U23 and U19 records in one run. 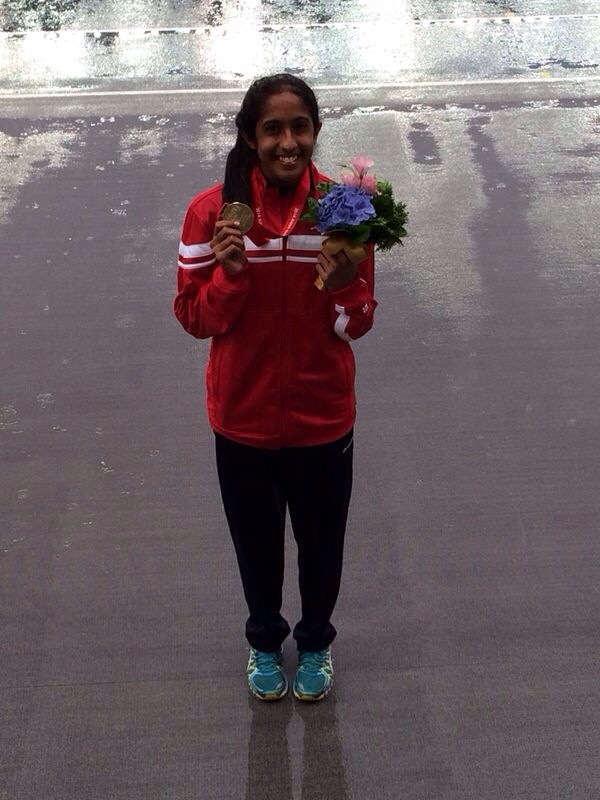 Congrats Shanti, you’re undoubtedly Singapore’s new sprint queen. Record pending ratification by SAA.